The free agency period of 2010 was all of the talk in the NBA from the 2008 season until LeBron James bolted to Miami. In most of the conversations, the talk revolved around James possibly leaving Cleveland for New York. If the Knicks could not land him, their focus would shift to Dwyane Wade. There was not much discussion about what New York would do if they could not land Wade, either. However, this was all cleared up when Amare Stoudemire signed there. But, it was clear Stoudemire was not the final piece for the Knicks. They began targeting Carmelo Anthony. 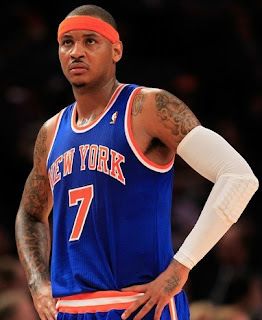 Carmelo Anthony had built the Denver Nuggets from a perennial loser into a contender over the span of seven years, gaining respect in the NBA. Even with LeBron James' powerful dunks, he could not lead his Cleveland Cavaliers to the playoffs until his third year. Carmelo Anthony and the Nuggets suited up for the playoffs every year, regardless of their opponents. But, after seven years and no championships, Carmelo Anthony announced he would not re-sign with his longtime Nuggets when his contract expired. Instead, he would be looking to join another superstar on another team. Mid-season, the Denver Nuggets were in the middle of a playoff run, but had no chance to breaking into the top four. Anthony was highly disappointed and the Nuggets opted to trade him before he left them with nothing. When Carmelo Anthony joined Amare Stoudemire and the New York Knicks, there was immediately discussion about how good they automatically became. Some said the Knicks were as good, if not better, than the revamped Miami Heat, with their big three. This talk intensified when the Knicks rebounded from a 15-point hole to defeat the Heat in Miami in Anthony's first trip to South Beach with New York. But, wins have been few and far between since their statement victory. The move to New York has not bothered Carmelo Anthony's skills. He has continued to put up the big numbers for the Knicks. But, when it comes to wins, New York is struggling. Before the trade, the Knicks were, at one point, close to breaking into the top four in the Eastern Conference. Now, they are close to finding themselves battling with the Indiana Pacers and Charlotte Bobcats for the final playoff spot in the east.